Over Christmas when Jon and I were visiting his parents in Scotland, we were given the task of organizing all our stuff that was stored in their garage. We moved to New York with 2 suitcases, so literally everything else we own – sofas, bookcases, books, photo albums, cds, pots, pans, candle sticks, an air pop popcorn machine – is in familial garages, lofts and barns. We sent our sofas off to the charity shop, along with boxes of things like Jon’s teenage collection of Fantasy novels, and my Grazia magazine archive. And then, in one of the boxes we hit gold. Two bottles of whisky, three bottles of vodka, and a bottle of Cointreau. Alan, Gardener To The Stars was having a cup of tea with my inlaws, having been cutting back brambles all morning. Gardener To The Stars because it seems that Ian Rankin, Alexander McCall Smith and a host of other literary noteables all live within a two block radius in Edinburgh, and Alan owns the gardening rights. Apparently, Ian is wont to ask him how Alexander is getting on with the new book, and vice versa in the spirit of gossip. But back to the Cointreau. An English woman meets a French man in black tie at a fancy bar. He hands her a glass “That’s a big one!” or some such nonsense, and fills it with enough orange liqueur to knock out a horse. They exchange double entendres for several minutes in the spirit of high camp romance. It really is a classic, right up there with All Because the Lady Loves Cadbury Milk Tray, and the Nescafe couple. We added a splash to our morning coffee (well, it was nearly Christmas) and went back to work. French sidecars are made with equal parts brandy, Cointreau and lemon juice, but I prefer the Savoy or English version, with more brandy. 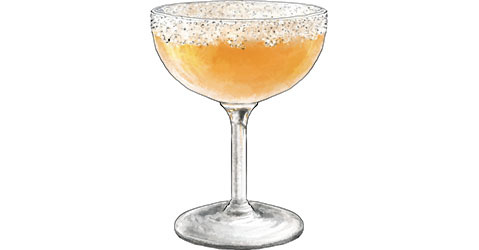 This entry was posted in The Wednesday Tipple and tagged brandy, cointreau, gardening, sidecar. Bookmark the permalink.